The season of gift giving is upon us, and so often we need just a little something to give to a teacher, a co-worker or party host. But it’s fun when that “little something” has a homemade touch and is a little out of the ordinary. 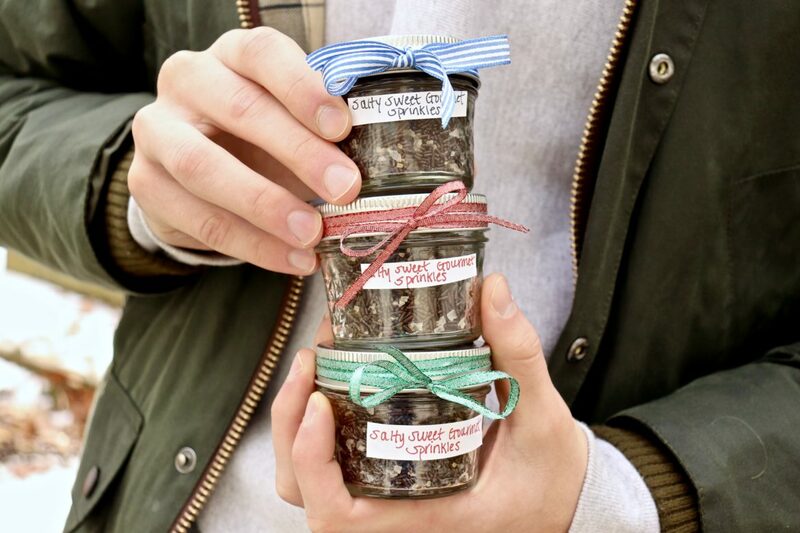 I gave small jars as holiday/hostess gifts last year and also served them with sundae and hot cocoa bars at several parties. A novel option (or addition!) to salted hot fudge sauce, they were truly a hit. Adapted from a holiday ice cream adventure and a treat the The Kitchn dubbed as “sprankles,” I reduced the amount of salt in the original recipe by half as I thought that amount was too much. For a stronger interplay of sweet and salt, you could increase the salt to 1/3 cup – just make sure it’s the flaky kind. A large volume of good quality sprinkles is key here. These are often called chocolate vermicelli, (I’ve used the Callebaut brand) and they actually melt when warm. That is to say they are real chocolate — no waxy additives or who-knows-what in there! 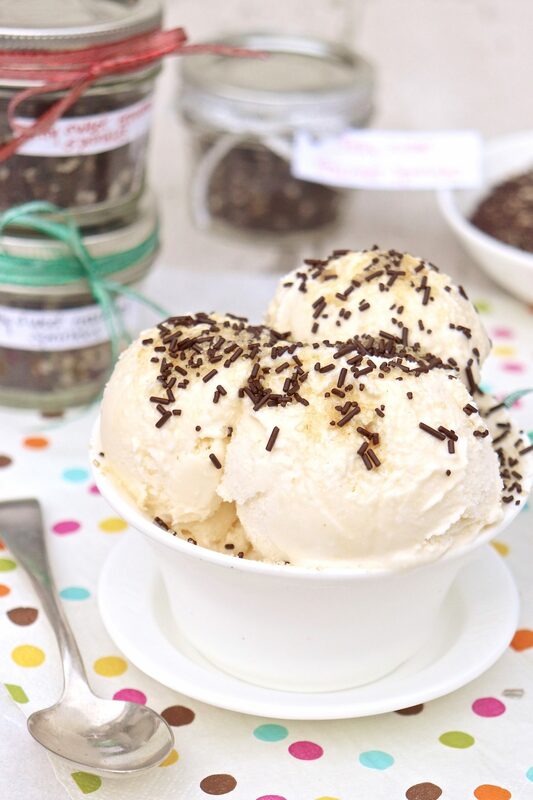 Of course, this means the sprinkles will cost more that the sprinkles we’re accustomed to seeing, so think of this as a special treat or a perfect gift. That said, when you break down the cost in terms of a gift, it’s reasonable. Also, the Callebaut brand I mentioned using (not an ad – just a helpful hint) is available in a variety of quantities. 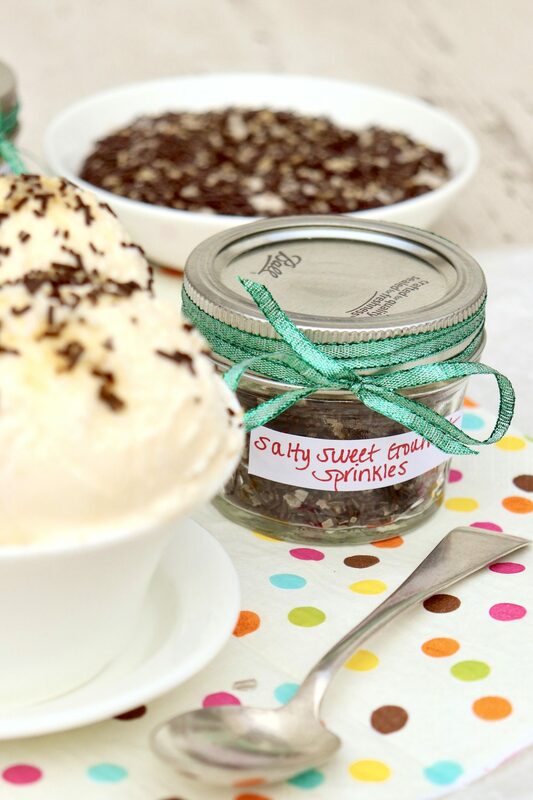 Sprinkles are no longer just for kids thanks to this salty-sweet upgrade! Perfect for gift giving and use on ice cream, hot cocoa, lattes, cookies and more. Place all of the ingredients in a large, zip-top bag, seal and gently shake to combine. Divide the mixture between jars. When stored in a cool, dark place (room temp is fine as long as it’s not too hot), the mixture will keep for 6 months or more. Add a label and tie with a pretty bow for gift giving. •Look for sprinkles without wax, usually labeled vermicelli. 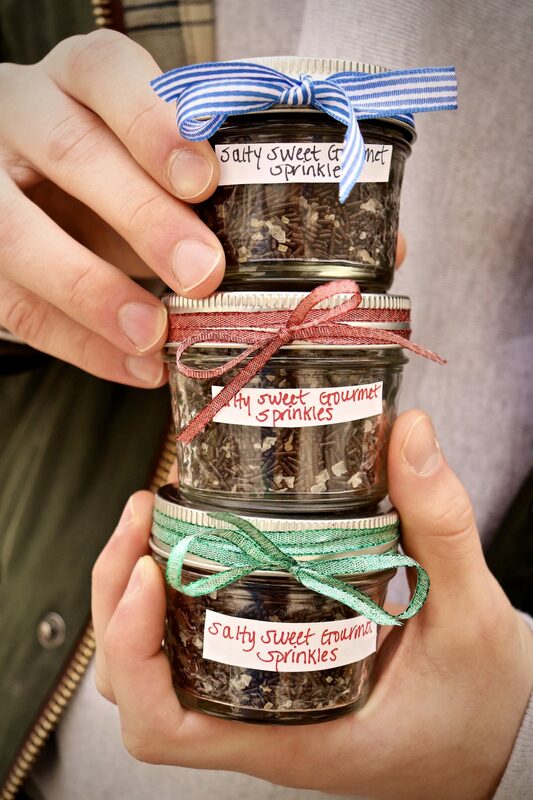 •Any flaky sea salt may be used; smoked salt is a nice option for those who enjoy that flavor. •Also, for proper distribution and flavor, it’s important for the salt to be flaky and the sugar to be coarse. If you can’t find demerara sugar or want to save a few dollars, simply use a coarse raw sugar or a similar sugar with a larger grain. Tip: Storing the jar upside down will help to keep the ingredients evenly distributed, as the process of flipping the jar between using and storing acts as a gentle shake. A quick question … where would I find demerara sugar? I don’t believe I have ever seen that at the grocery store. I just love your yummy culinary ideas and have SO many in my ever-expanding recipe file! Awww, thanks Anne! I’m so glad your file is growing! I occasionally see demerara sugar in the baking aisle of larger grocery stores, and it can be purchased online. Truly though, it is fine to use any coarse sugar like turbinado or a basic raw sugar. Just look for something with larger crystals. I’ve purchased it at SKH. Ann, where best to buy the chocolate sprinkles?